During the course of this crypto bear market we have seen lots of attempts to determine, whether the whole market is oversold or not. The majority of these attempts is made with technical analysis, as you can see by the vast amount of charts posted on TradingView and on Crypto Twitter. While TA is certainly a powerful tool, most of these analysts seem to change their mind three times a day and fail to predict the future more often than not, which makes it difficult to find the few good analysts among many bad ones. In addition to TA, there are metrics like CoinFairValue, which assigns a fair price to a coin based on a variety of factors or the Crypto Fear and Greed Index, that calculates a value between 0-100 to display the sentiment of the crypto market. In this article, I want to present you another method to look at crypto prices, which is the “all time volume weighted average price” (ATVWAP). Why ATVWAP and not simply average price? In addition to the previously mentioned methods to analyze Bitcoin’s price, the average price of Bitcoin was put in the spotlight during recent months. The last 9 years of Bitcoin’s daily prices were added up and divided by the number of days it traded publicly. The result is an average price around 1600 USD and the narrative started to spread, that these 1600 USD are the fair price of Bitcoin. While any price action is certainly possible for Bitcoin (also 1600 USD and below), this approach of determining a fair price by looking at the average price is not reasonable. As we can see, the trading volume on Bitcoin has increased exponentially. The data on this is mainly from CoinMarketCap.com (from 2014 onwards), Bitcoinity.org (before 2014) and Bitcoincharts.com (before 2014). Of course, we have to consider that some exchanges’ volume consists 95% of wash trading and certainly, some of the volume displayed in the graphic is not investors buying Bitcoin, but wash trading happening between different bots. However, CoinMarketCap excludes several exchanges from their volume calculation and therefore some of the most obvious wash trading exchanges should not be included in this analysis. Adding to that, the CoinMarketCap volume doesn’t include OTC trades, which reportedly have been very high throughout 2018 and 2019 and should equate the fake volume included in this graphic. We can see, that Bitcoin had three major bull runs: One from 0.05 USD to 30 USD, another one from 2 USD to 1100 USD and the last one from 200 USD to 20k USD. Each time after the bull run, the price declined massively. The ATVWAP shows some interesting insights for Bitcoin’s price action during the declines. In one of the three price declines, the ATVWAP was very close to the actual bottom. In January 2015, the ATVWAP was at 210 USD and Bitcoin’s price bounced from the 200 USD level. In 2011 and 2018 however, the price went below the ATVWAP, so it cannot be considered a clear bottom for every major price decline. In 2011, the ATVWAP went as high as 6.7 USD after the bull run, but Bitcoin’s price went down to 2.2 USD. So, if you would have bought at the first time Bitcoin hit the ATVWAP, the price would have declined another 67%. A decline after Bitcoin’s price hit the ATVWAP level also happened in 2018, where the ATVWAP was as high as 4850 USD while Bitcoin hit its (temporary?) bottom at 3120 USD. Therefore, buying at the first time Bitcoin’s price hit the ATVWAP didn’t necessarily turn out profitable in the short-term. However, it can be noticed in the chart that after the two declines in 2011 and 2014, Bitcoin had an accumulation period close to the ATVWAP. “Close to” means in this volatile market a price difference of +25% to -25% in comparison to the ATVWAP. In 2012, this accumulation period lasted from January to July 2012, where the price hovered around the 4.5 USD to 6.5 USD level, with the ATVWAP being at 5.5 USD. In 2015, Bitcoin stayed mostly above the ATVWAP (at 210 USD), but didn’t reach the mark of 300 USD for 10 months, so the accumulation period lasted from January 2015 to October 2015. Since late 2018, we are seeing this same kind of accumulation period close to the ATVWAP and it has been going on for 4 months now. So, if history would repeat itself, this accumulation period would continue until the 2nd half of 2019 followed by a price surge of Bitcoin above the ATVWAP value (currently at 4600 USD). However, it is not certain that this will happen, given that the sample size of Bitcoin’s major price declines is very small. It should also be noted that the ATVWAP adapts to the downside, so if Bitcoin should stay below 4000 or even go way lower on huge volume, the ATVWAP will go lower as well. In fact, it already went down from 4850 USD in November 2018 to 4600 USD on March 16, 2019. In this article, I discussed the all-time volume weighted average price (ATVWAP) as an overlooked method to analyze Bitcoin’s price. 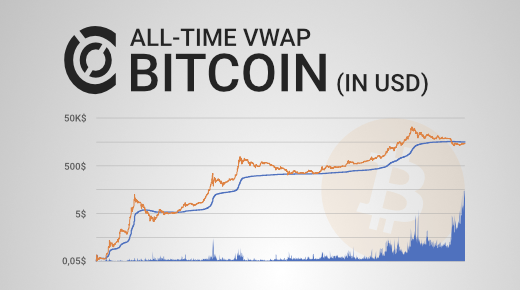 Throughout its history, Bitcoin traded mostly above the ATVWAP. After the two major bull runs in 2011 and 2013, the price declined massively and found support only once at the ATVWAP level. However, in both cases there was an accumulation period around the ATVWAP for several months. In the recent price decline during 2018, Bitcoin’s price also went below the ATVWAP. If history will repeat itself, the current accumulation period around the ATVWAP level would continue for several months followed by a price surge after that. However, given the small sample size there is no guarantee for such a price movement.